Our themes will only work on self-hosted WordPress websites. If you need hosting, you can get it here or here. Our themes are built on Genesis Framework that is INCLUDED with every theme purchase. There is no need to purchase the framework separately – yay! 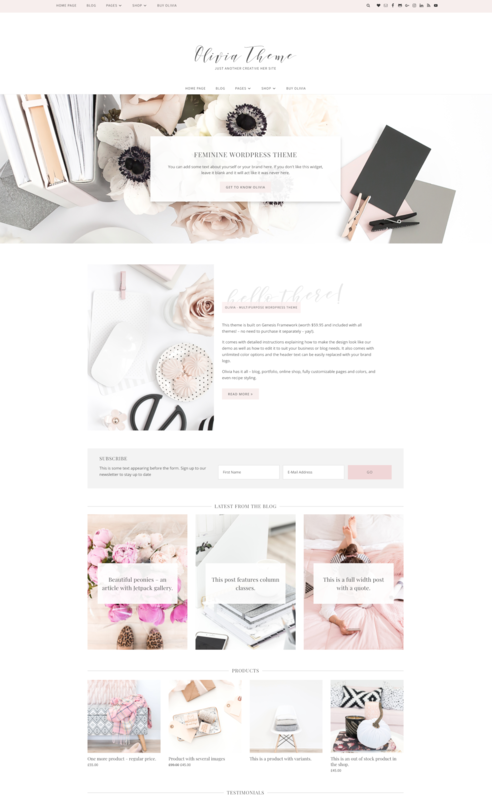 Olivia is a multipurpose theme that has it all – blog, portfolio, online shop, customisable pages and colors, and plenty of widget areas so you can modify this design in a way that suits your business needs. Every design comes with detailed instructions explaining how to make your theme look exactly like our demo. Additionally, you will get HTML cheat sheet file, thanks to which you can easily and quickly add some cool stuff to your page or post content. 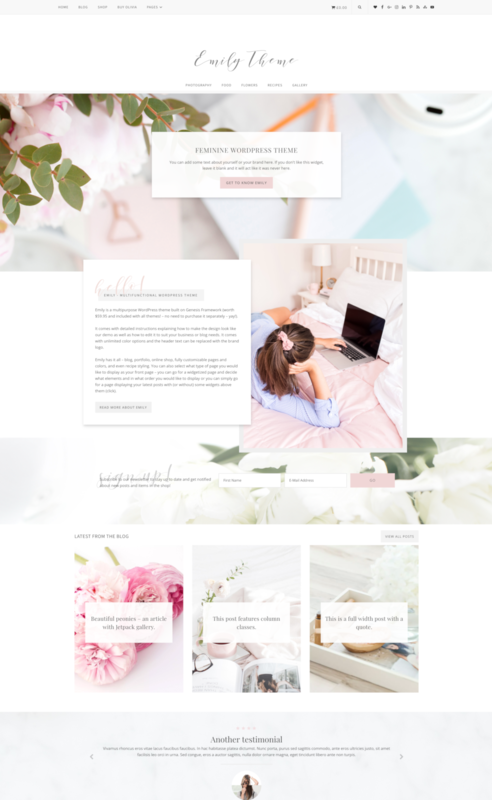 Olivia Theme features fully widgetized front page so you can highlight the elements your brand or blog needs more focus on. The front page also comes with an eye-catching full width image widget with parallax effect as well as a text box that can be used to introduce your brand or inform your clients about current offers. Furthermore, it also has a beautiful ‘About You’ widget featuring an image, short description and button that can take the reader to another page. If you prefer to have your latest posts displayed on front page instead, you can set up the blog page (click) as your front page. The theme also comes with Category Index, which is another fully widgetized page (click). It can be used to organize your shop items or posts into categories or combination of both so that it is easy for your readers or clients to find stuff they are looking for. When displaying posts in any widget area, you decide how many posts you want to display, in how many columns and with what image size. You can also hide the post title, date or post excerpt. The example of different types of featured post widget customization can be seen on Category Index page (click). Single post pages display the featured image in a unique way (click) – the image has a parallax effect with post title and date overlying. The colors of this theme can be easily changed (without touching any HTML code!) and the site title can be replaced with your own logo. The design is styled to work with popular WordPress plugins such as Jetpack subscription, Genesis eNews, EasyRecipe, Portfolio, Contact Form, Instagram Feed and WooCommerce.